That town is Walnut Grove, California, 20 miles or so south of Sacramento in the Sacramento River Delta, a low-lying rural area halfway to Stockton - and that 1500-foot candelabra isn't even the tallest tower down there these days. I'd seen these towers from a distance a decade or so ago, on my first trip to Sacramento, but seeing them from a distance is hardly the same thing as seeing them close up, especially when a former Boston colleague - Bob Hess, late of WBZ - is now the chief engineer of Viacom's Sacramento TV stations and thus in possession of the keys to three of the four big sites here. So it was that on a particularly hot and humid late July afternoon, I found myself following Bob off I-5 and down some remarkably remote roads en route to a close-up look at these towers. Some history, first, as is our wont: When TV came to this part of California in the mid-fifties, it was not immediately obvious that Sacramento's TV stations would have any greater reach than the city's radio stations, which is to say much beyond Sacramento and the immediate vicinity. Stockton, 50 miles to the south, got a TV station of its own in 1954. It found a spot atop Mount Diablo that allowed it to "cover" not only its home market but also parts of Sacramento and the San Francisco Bay Area, and thus was born "KOVR" on channel 13. But KOVR, which began as an independent, wanted an ABC affiliation (KCRA was NBC and KBET was with CBS), and ABC didn't want the big KOVR signal drawing viewers away from its owned-and-operated KGO-TV in San Francisco. 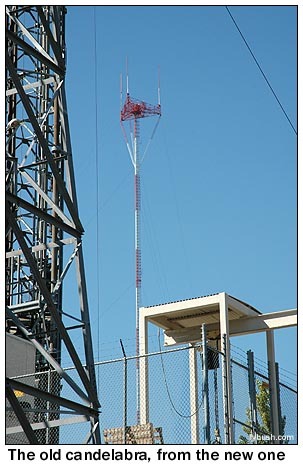 So KOVR agreed to move down off its perch high on Diablo, to a temporary spot in the hills near Jackson. It still needed to find a spot that would allow it to serve all of what had by now become the Sacramento-Stockton-Modesto market, though. And if KOVR was going to reach all of that market, stretching 100 miles up and down the Central Valley, KCRA and KBET (which became KXTV in 1959) weren't about to be left behind with Sacramento-only signals. That's how the first Walnut Grove tower came about: a joint effort of all three stations (operating as "Transtower Inc.") to build what would be, at the time, the tallest candelabra ever erected, even taller than its close relative, the original Cedar Hill candelabra in Dallas. 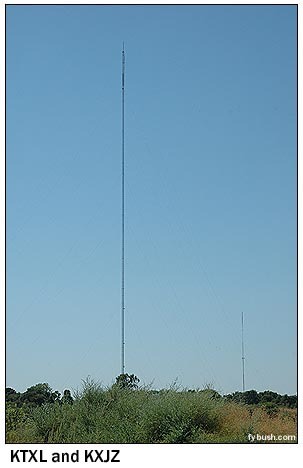 In 1985, independent station KTXL (Channel 40), which had been using a 1000-foot tower north of here, built a Walnut Grove tower of its own, rising almost exactly 2000 feet from a spot on Twin Cities Road a couple of miles north of the candelabra. 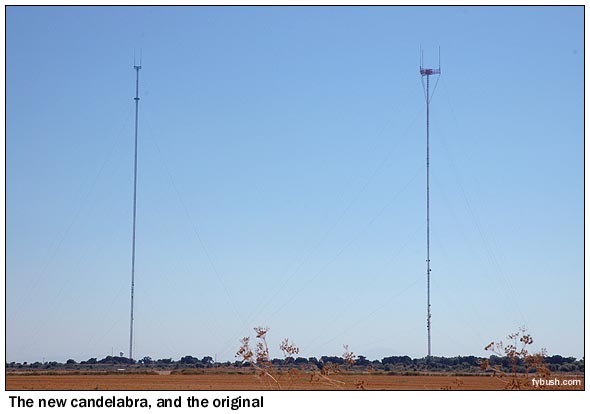 And that, in turn, touched off a height war - if KTXL (and KVIE, which moved over from the original candelabra) could be that high, the others wanted an equally tall tower. 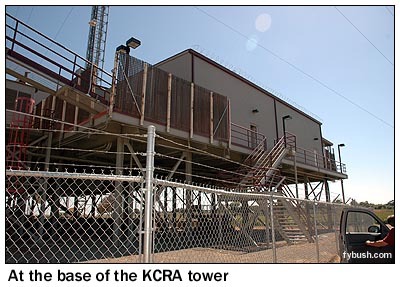 So KXTV and KOVR partnered to build a 2049-foot candelabra less than a mile east of the original one, while KCRA struck out on its own to build a 2000-footer just south of KTXL's. The original tower remained in place as an auxiliary site - and drivers passing between Sacramento and Stockton were greeted by one of the more impressively tall tower farms to be seen from any highway anywhere. Our 2005 visit began at the northern end of the tower farm - not quite all the way north (that would be the KTXL/KVIE site on Twin Cities Road, the only one of the big four at which Bob doesn't have a transmitter), but at the KCRA tower that sits in an incredibly isolated location on the east side of the Sacramento River. Getting there requires some unexpected twists and turns - even though the tower is west of I-5, the access road comes in from the east, and the road that leads there is closed for construction. Once we get there, there's another surprise: the transmitter compound is elevated some 24 feet above the ground on pilings. Turns out we're in the river's floodplain here, and flood it does, though it's hard to imagine on this midsummer day. That explains the hoist at the edge of the platform surrounding the transmitter buildings, too: when it floods, the only way to get here is by boat, and if you need to bring a transmitter out here when it's flooded, you want to have a good way to get the box out of the boat and up to the platform. 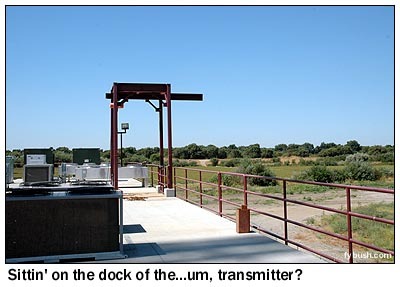 This site's main tenant, of course, is Hearst-Argyle's KCRA - but along the way, it also became home to the independent UHF signal on channel 31, which began in Sacramento as KMUV (the "Movie Station") and was KRBK by the time it moved out here. Today, it's Viacom-owned UPN affiliate KMAX-TV, and both its analog signal and its DTV on channel 21 call this site home. KCRA still doesn't have its DTV on from here - it's using the original candelabra for that, with plans to move the DTV (on channel 35) over to this site. Two other DTVs will call this home, too, when the transition is complete: KCRA's sister station, KQCA-DT (Channel 46) and Pax outlet KSPX-DT (Channel 48). 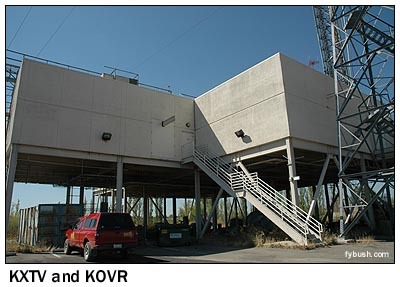 KQCA's analog transmitter, on channel 58, is over at the KXTV/KOVR candelabra, and KSPX's analog, on channel 29, is way up in the Sierra foothills at the old channel 10 site. 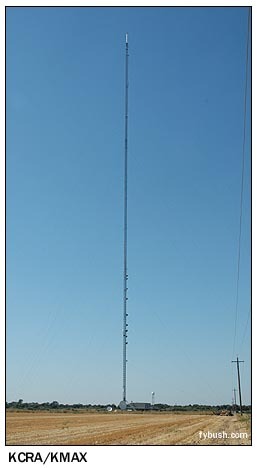 The tower's a most impressive sight as we drive away, and well worth making a stop to grab the medium-distance views you see above, showing KCRA's interesting helical antenna at the top of the tower, with KMAX's antenna just below. We, however, are headed south, back out under I-5, then down to Walnut Grove Road and under 5 again, heading west to the original candelabra and its newer cousin. These towers, too, are very nicely visible to the south from the KCRA site, which is where we grabbed the shot you see above. That's the new one on the left and the original on the right, and it's to the new one we go first. 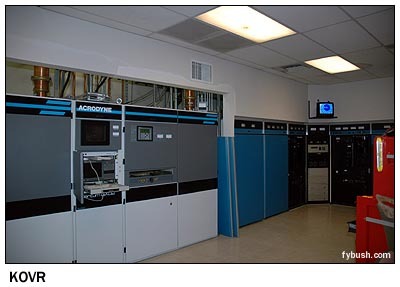 Having been a Sinclair station, KOVR inevitably has an Acrodyne transmitter (the broadcaster owns the transmitter company) for its channel 25 digital signal, with the Harris handling the analog signal on 13. A few months after our visit, this site made headlines in a most unwelcome way, when a "BASE" jumper from the Bay Area decided to trespass here to celebrate his birthday. He climbed the tower, jumped, and got himself stuck on one of the guy wires, requiring a dangerous and expensive rescue. This column doesn't condone such activities - towers are for photographing, and perhaps for an elevator ride if an engineer offers, but they're not for climbing without permission. See that fence in the picture to the left? It's there for a reason. 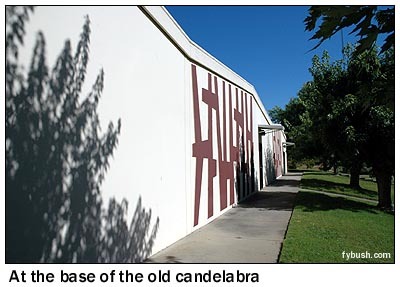 In any event, the old candelabra, seen at the center of that photo, is our next stop. It's by far the most accessible of the sites, located at the end of one of the side streets in the little town of Walnut Grove, and it's also the least flood-prone of them, since it sits behind - actually, right on - a levee. 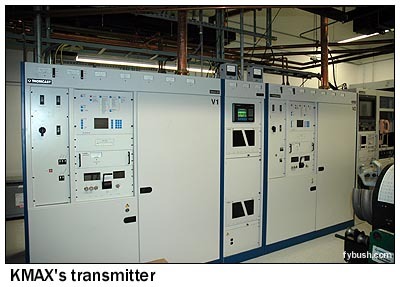 The transmitter buildings at this site were built side-by-side, and we're treated to a nice tour of KOVR's rooms, which are mainly used these days for storing of old studio and transmitter gear. There's a vintage RCA transmitter here (I want to call it a TT-30, but I'm sure an RCA expert out there will correct me if I've got that wrong) that needs some work, and a big control room from the days when transmitter sites like this were staffed, but the goal is to use this space, eventually, as an emergency transmitter and studio facility for both KOVR and KMAX, should the need arise. 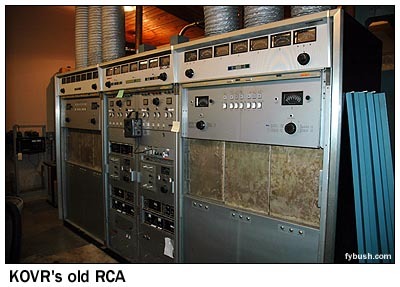 At the moment, the only stations using the old candelabra as a primary transmitter site are KCRA-DT (Channel 35) and Family Radio's 88.1, which was then KEDR and has since taken on the KEAR-FM calls that used to be at San Francisco's 106.9. 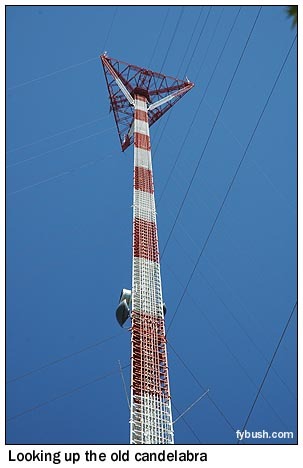 It's a pretty neat bunch of towers - but we still have more to see on this long, hot afternoon, and so, with profuse thanks to Bob for the tours, we head out to I-5 again, bound for Stockton and some truly ancient radio history, which we'll show you next week. Many thanks to Bob Hess for a great tour!